There are customized RVs, and there are reasonably priced RVs. There are few (if any) reasonably priced customized RVs. The average RV is configured for a family on vacation. Sleeping accommodations are maximized — storage, seating and working areas, not so much. Vacationers typically spend much more time out of the unit. Full-timers have different needs. There is usually just the two of you. While there may be many vacation-like moments, the RV is your home and has to be set up for day-to-day living. That means less space for sleeping areas and more for meal preparation, crafts, business, computing and other daily tasks. TV watching is not just an afterthought to keep kids busy on rainy days, so comfortable TV set placement and seating are also important. We are seniors who retired four years ago, and started living full-time in a 30-foot Class C RV. As we planned our new life, I was determined to make sure that we ate and slept as well in our RV as we did in our town house. Before we began, we took a serious look at the layout of the living area and equipment originally installed on our unit. We needed ways to maximize its utility or add components to improve our RV's capabilities. We looked to other RVs and different styles of new RVs for our inspiration. 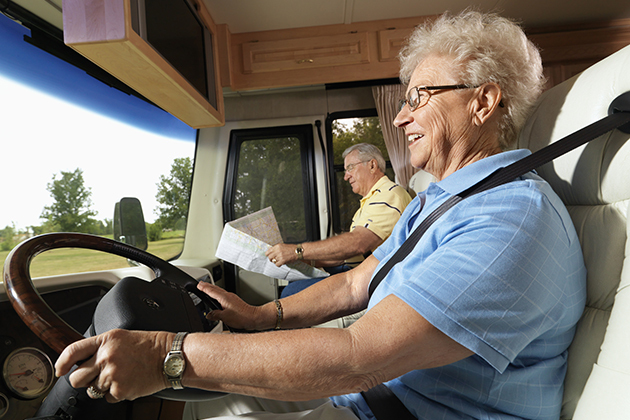 Here are some ideas for making your RV more livable. All of these fixes and modifications take minimal tools and skills, and the supplies needed are readily available at a good hardware shop. Camping and carpets do not mix. Sand and dirt tracked inside are inevitable. This is one problem that is surprisingly easy to fix. RVs are built on a floor of plywood. Carpet is the first thing installed, and cabinets and other furnishings are built on top. The good news is that the carpet is generally stapled to the wood, not glued. Use a sharp box cutter or carpet knife to cut the carpet into pieces, and pull up. You may need pliers or a pry to dislodge the staples. The same is true of floors that are mixed carpet and linoleum. The bad news is removing the carpet under the slide-outs. Cut out most of the carpet, and you will have a strip under the slide-out. Use a pry to curl the remaining carpet back farther under the slide. Then cut into the bottom of the carpet and pull that piece out. You may have to do this a few times. Once you have the plywood bare, there are two easy and inexpensive ways to put in a new floor. One is to use stick-on floor tile. Dress the bare plywood with a sealing compound, establish a straight edge, and peel and stick the tiles. Buy enough to have a few extras of the same batch for mistakes, replacements, etc. For a little more you can install a floating laminate floor in much the same way. Both are available at the big box stores. If the plywood underneath is thin, you might want to consider insulation. You can now buy thin sheets of plywood underlay that are bonded to a thin sheet of foam insulation. They are meant for basements, but will work well in an RV. Tack them down on top of the plywood, then finish with tile or laminate. Just make sure you have clearance for your slides to come in when finished . Area rugs will also do the job, but invite extra cleaning. Full-timers spend more time in their main cabin than the average RVer. They eat, compute and communicate, transact business and correspondence, read, do crafts and household chores, and of course, watch TV. They spend a lot of time preparing meals, but don't sleep there. 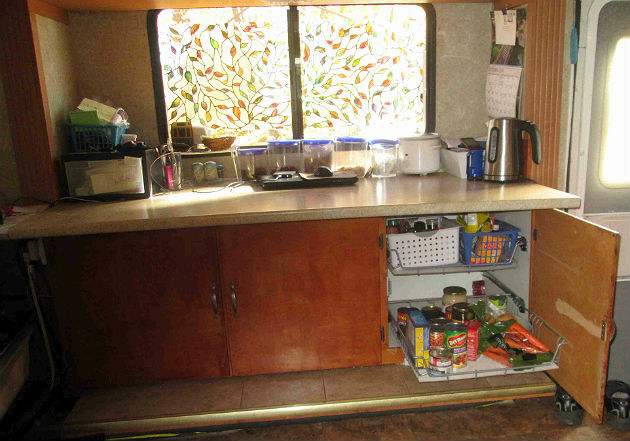 Many larger RVs and fifth wheels have good food and prep areas, but they still waste space in other areas. TVs may be set too high, too close or at poor angles. Regular RVs maximize sleeping accommodation. Typically they allow for two over the cab, two on a sofa bed and two kiddies on the dining table. Full-timers need none of this. What they do need is more storage, more food prep area, more table space, and a comfortable layout for watching TV. If you are a couple full-timing, that already says you get along, so the RV bedroom is your sleeping area. If you need occasional guest sleeping (grandkids, friends, etc. ), you can carry a nice self-inflating bed that tucks away until needed and fits on the main cabin floor. Tents are also good for kids. Our class C RV has the over-the-cab sleeping area. Some folks have replaced the mattress with elegant cupboards. They look great, but have several issues. The added weight overhead is not so great for the unit. This also fully cancels out any sleeping use (which may not be a bad idea) and is not a low-cost option. Our bunk had two twin-sized mattresses, so I just stacked them and pushed them to the front. I topped them with a thin sheet of plywood to make a shelf. By not installing fixed cabinets, the area can be returned to sleeping status by unpacking the mattress or using the inflatable bed. Worst case scenario: Most camps have inexpensive rental cabins for longer stays. I tiled the top of our new cabinet and added a good quality tabletop oven. It is a regular, convection oven and even has a rotisserie adapter. The main cabin had a hide-a-bed sofa. These things seldom make either good beds or good sofas. We took it out, and added an 18-inch kitchen cupboard and a shelving unit. This cupboard allows storage of a full range of pots and pans, plus all my serious knives and kitchen utensils. The RV cutlery drawer is woefully inadequate for anything more than a bit of tableware. I love my propane cooktop. I use nonstick cookware, but my one indulgence is a wok — stir-fry recipes are ideal for this lifestyle. Our nonstick pots cook well and clean up with a lot less water than a normal pot. I did give up my cast-iron pans, as their limited use did not justify the space, weight or extra cleanup needed. The propane oven, not so much. RV propane ovens are small and imprecise for temperature settings. They are also easy to forget about and leave on. Besides, you never hear about someone who put his head into an electric oven and baked himself to death. Ours makes a fine bread box. I tiled the top of our new cabinet and added a good quality tabletop oven. It is a regular, convection oven and even has a rotisserie adapter. It could be a toaster oven too, but that would be serious overkill. It will cook up to a 10-pound chicken, and the electronic controls are easy to use. We also have a microwave oven and use it like most folks do. Just don't use both ovens at once on a 30-amp service. I took a good-sized cutting board and added cork feet. I also cut a hole in it under the faucet so I can run water into the sink without moving it. 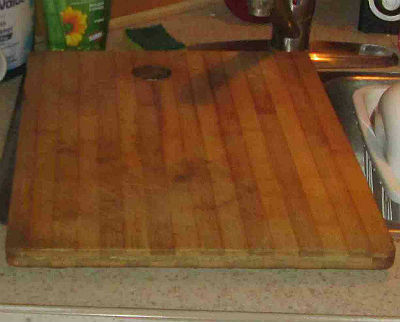 I took a good-sized cutting board and added cork feet (available as floor protectors in any dollar store). I can use it on the table or fitted over the sink. I cut a hole in it under the faucet so I can run water into the sink without moving it. The driving cabin roof line is scalloped, so I used a larger sheet of plywood to fill that gap and provide more shelf space. Keep your head down when moving from the cab to the cabin. Dollar stores sell rolls of nonskid matting to use under all stuff on the shelf. I use smaller bins to keep stuff in place, and I keep an empty bin in the back to hold loose odds and ends when we move. Another option is a short plastic chest of drawers, but that works best for folks taller than me. Many RVs have restaurant booth-style layouts for dining. The benches and tables are placed at right angles to the window. Tables are usually smaller and adjustable to allow yet another sleeping area. Larger RVs and trailers may have a small table and four dining room chairs. The booth-style benches are supposed to seat four, but you have to be close friends or very slender to sit comfortably. Like most folks, we sit facing each other. Good for eating, but poor for watching TV. In both cases, RV tables are small and ill-suited for anything more than eating. Many are made to fold up for more sleeping space for kids. Working on the computer, on crafts, on correspondence, ironing or any task requiring table space had to be scheduled as they could not be done at the same time. Again, I stole solution ideas from fellow campers. We did not need booth seating, nor a small folding table or kiddie sleeping space. Widening the table was not workable in the small area, nor was lengthening it as it was. So, I turned it around. I designed a cabinet that fills the slide-out area. The cabinets are topped with an inexpensive custom-made countertop. These are available at Ikea or a big-box hardware store. The big-box hardware stores will cut wood to order, so I designed cupboards to be built in. The wood cost about $100, and the top $400. I have some carpenter skills, but more importantly, I had the skill to talk my expert friend into helping me. The tabletop is about five times bigger than the old table. It's useful for multitasking, and the storage underneath is twice what I had in the benches. I even have space for slide-in baskets for the pantry. 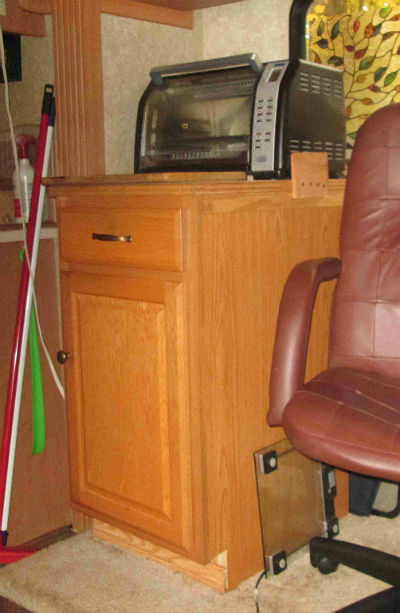 We needed seating that fit easily into the RV and was comfortable for dining as well as watching TV. We found that managers' office chairs work the best. They have solid arms, tilt and height adjusters so are good for dining and are comfortable for watching TV and reading. They are on wheels, so we can roll up to the table to eat and easily turn to watch TV. We usually entertain outdoors, but we keep two folding card chairs for guests. If you are in a fifth wheel or Class A, it still makes sense to change this area. Ditch those kitchen chairs. Take out that small table. You can create or buy a small cabinet and top it with a larger countertop. Place it in the dining-area corner and use managers' chairs to sit at right angles to each other. The cabinet is storage for your business or craft supplies. You can keep your other seating for guests, or repurpose the area as a craft/sewing area or computing area. The chairs on wheels give you much more flexibility. Thanks to modern technology, everyone can have a large flat-screen TV. RV manufacturers have many ways to set them up, with overhead racks, pop-up TVs, wall-mounted TVs and other configurations. But there can be problems with some setups. Your delicate large-screen TV is affixed in some way to the wall or frame of your RV, and it depends on the RV's suspension as a shield against bumps. More importantly, viewing angles are often compromised — too close, too high or too angled. We already had a 37-inch HD flat-screen TV — big enough for a great picture, small enough to fit our RV, easy to pick up. I agonized over how and where to mount it in the main cabin for ease of viewing and safe travel. My good friend, who is a TV technician, a cabinetmaker and a man of uncommon common sense, looked at my plan. He noted how easy the TV was to move, and how easy to connect using quick-connect co-ax connectors. He pointed out that the best place for the TV to ride was face down on top of the bed. The best viewing angle was at one end of the cabin, not on the side and at eye level while seated. He suggested we sit the TV on a small table between the driving seats. For traveling, it's light enough to pick up and lay on the bed. You can use a small camping table or buy a cheap plastic one from a big-box store. Being cheap plastic, you can cut the legs to fit your space. We also had a 20-inch flat-screen TV in our house bedroom, and it was easy to place on a swivel mount it on the RV bedroom wall near the TV wall plate. The swivel mount absorbs road shocks and adjusts viewing angles. Most RVs have an internal wiring system to connect TVs to the antenna or cable feed. Satellite TV is a problem because each TV requires a separate connection. I put in a small corner shelf above the bedroom TV for the satellite receiver and ran the sat cable through the window. I took a small pieces of round, foam pipe insulator, cut it to size and slid it over the edge of the window pane, shutting out the wind and the creatures. For the main cabin TV, the cable can come through a window or the front door. Setting up the TV is quick and easy as soon as we park. If you're a full-timer, I hope these ideas help make your RV more livable. Next time, we'll take a look at some tips and tricks for full-timers. Paul Redvers is a retired Canadian civil servant who loves hockey and Canadian beer, but hates snow and cold. When he discovered he could get hockey and beer down south in the winter, he and his wife became a full-time RVers. They spends summers in Southern Ontario, and winters where it is warm — Florida, California and Texas. Not being in a hurry, they uses Passport America camps for short stays while on the road.